But my favorite piece simply has to be the Morgan Stanley research report from June 30 2008 “Overweight Rating” on Lehman Brothers — “Bruised, Not Broken, Poised for Profitability“. 60 days later, Lehman Brothers filed what was then the largest bankruptcy in the United States. This is (literally) what the category “Really Really Bad Call” was invented for. Who was the author of this steaming piece of [s**t], and where is he today? Why, he is Patrick Pinschmidt, and he is a Senior Policy Advisor at U.S. Treasury Department! (You could not make up stuff this un-f***ing-believable even if you tried). “I attempt to cultivate my own insights and to recognise the precarious uncertainty of global macro trends. I attempt to observe such things first hand through my extensive travel (I promise no more YouTube videos), and seek to understand their significance by investigating how previous societies coped under similar circumstances. But first and foremost, I am always preoccupied with the notion that I just do not have the answer. I am not blessed with the notion of certainty. Someone once said we should think of the world as a sentence with no grammar. If we do I see my job as putting in the punctuation. But above all, my job is to make money. 1. Successful but contentious macro risk posturing. 2. The need to choose the asset class offering the highest probability of payout should the conviction hold true whilst offering an asymmetric loss profile should the original premise prove unfounded. 3. A best in class risk technique that stop losses the narrative and responds early with loss mitigation procedures (i.e. a method of staying solvent, rational and disciplined under pressure). I have always figured that the first is the real key. That success was simply a matter of contentious macro posturing. In other words, going long very rich risk premium or buying cheap stuff. It is my assertion that what makes a great fund manager first and foremost is the ability to establish a contentious premise outside the existing belief system and have it go on to become adopted by the broader financial community. Bruce Kovner expressed the idea more eloquently when he said, “I have the ability to imagine configurations of the world different from today and really believe it can happen. I can imagine...that the dollar can fall to 100 yen”. I am sure you are nodding in agreement, except Bruce was saying this when the USDJPY was well over 200, not today's rate of 80! John Mauldin: A Gold Standard? As of this past January, any bank operating in the United States with more than $50 billion in assets must have the business equivalent of a living will—plans for what to do in the event of catastrophe. Every well-managed business should have contingencies and ways to assess its health and viability. But the fact that the Dodd-Frank financial regulations require the largest banks to submit detailed plans for worst-case scenarios suggests something is seriously amiss. We all know what happened when the "too big to fail" banks teetered on the verge of collapse in 2008. The government stepped in with $700 billion of taxpayer money, justified by the notion that failed banks would destroy our economy. (Of the eight biggest U.S. banks, only J.P. Morgan Chase didn't receive a bailout.) Three years later, we have Dodd-Frank's complex regulations and banks that are bigger than ever. The solution isn't to demand that the big banks plan for disaster—it's to take steps to prevent disaster. We need bank reform that addresses the root of the problem: Some banks are simply too big—for their own good, as well as that of investors, the economy and their customers. I’ve seen this in a few places, though none that has allowed printing of the document yet. If I come across one, I’ll try and update the link below. Thanks to Santangel's Review and David for passing this along. 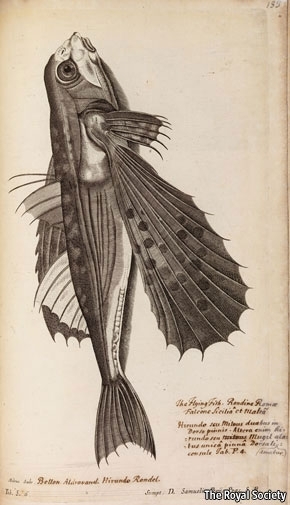 This engraving, of a flying fish, almost changed the course of history. It is one of a set from John Ray’s and Francis Willughby’s book“Historia Piscium”, published in 1686 by the Royal Society and recently put online by them for the edification of scholars everywhere. The society, which today proudly describes itself as the world’s oldest scientific academy (it was founded in 1660), was almost bankrupted by the expense of the high-quality illustrations in what was regarded at the time as a leading natural-history text, but which unfortunately failed to sell as well as its publishers had hoped. As a result, no money was left over for another publication, “Principia Mathematica”, by Isaac Newton. That the most important volume in the history of physics, which described the laws of motion and of gravity, saw the light of day the next year was, in the end, due to the deep pockets of Edmund Halley, of comet fame. Halley was the son of a wealthy soapmaker and he stumped up much of the cost himself. So how do we spot the future—and how might you? The seven rules that follow are not a bad place to start. They are the principles that underlie many of our contemporary innovations. Odds are that any story in our pages, any idea we deem potentially transformative, any trend we think has legs, draws on one or more of these core principles. They have played a major part in creating the world we see today. And they’ll be the forces behind the world we’ll be living in tomorrow. It’s no secret that the best ideas—the ones with the most impact and longevity—are transferable; an innovation in one industry can be exported to transform another. But even more resonant are those ideas that are cross-disciplinary not just in their application but in their origin. This notion goes way back. When the mathematician John von Neumann applied mathematics to human strategy, he created game theory—and when he crossed physics and engineering, he helped hatch both the Manhattan Project and computer science. His contemporary Buckminster Fuller drew freely from engineering, economics, and biology to tackle problems in transportation, architecture, and urban design. Sometimes the cross-pollination is potent enough to create entirely new disciplines. This is what happened when Daniel Kahneman and Amos Tversky started to fuse psychology and economics in the 1970s. They were trying to understand why people didn’t behave rationally, despite the assumption by economists that they would do so. It was a question that economists had failed to answer for decades, but by cross-breeding economics with their own training as psychologists, Kahneman and Tversky were able to shed light on what motivates people. The field they created—behavioral economics—is still growing today, informing everything from US economic policy to the produce displays at Whole Foods. April 27 (Bloomberg) -- David Chambers, lecturer at the University of Cambridge, discusses investment tips from a past master - John Maynard Keynes. April 27 (Bloomberg) -- In today's "Movers & Shakers" Bloomberg's Dominic Chu reports that Bruce Berkowitz, manager of the $8.4 billion Fairholme Fund, sold stakes in Citigroup Inc. and China Pacific Insurance (Group) Co. during the quarter ended Feb. 29, according to a regulatory filing. He speaks on Bloomberg Television's "In The Loop." April 17 (Bloomberg) -- Aswath Damodaran, a professor of finance at New York University, and Lawrence Haverty, a portfolio manager at Gamco Investors Inc., talk about the performance of Apple Inc.'s stock. They speak with Betty Liu on Bloomberg Television's "In the Loop." We believe there are two general kinds of mispricings - structural and psychological. Structural mispricings exist when an event occurs that forces a large population of owners to sell without any change in the investment’s intrinsic value. Examples of structurally induced selling would include: when an investment is deselected from an index, when a company is spun off from a larger parent company, or perhaps when a company’s credit rating is reduced. These scenarios are just a few examples that produce a good flow of ideas into our workout category which we can then use to apply an appropriate lens. Psychological mispricings are driven from collective investor psychology which induces broad selling or a lack of buying in an investment, asset class or group of securities. Psychological mispricings have produced some of our most compelling compounding opportunities. The study of how human beings perceive the world is a helpful tool to understand the psychological biases that produce mispricings. More than half of our brain is used for processing sensory information with the majority of that processing being vision. Evolutionary psychologists have said that animals from fiddler crabs to humans use eyesight for collision avoidance, suggesting that vision is for directing action not providing knowledge. We want to focus and apply a lens in the direction where there is a gap between the directed action of the marketplace and that of knowledge (truth). Two universal visual impairments are myopia and hyperopia. Individuals, who suffer from myopia, or myopes, have difficulty seeing distant objects; hyperopes have difficulty focusing on near objects. These impairments can be used to describe the optical challenges that affect investors. People who might be perfectly happy with their lot in isolation become miserable when they see others do better. In the world of investing, most people find it terribly hard to sit by and watch while others make more money than they do. Howard Marks: Emotion and ego: A lot of the drive in investing is competitive. High returns can be unsatisfying if others do better, while low returns are often enough if others do worse. The tendency to compare results is one of the most invidious. The emphasis on relative returns over absolute returns shows how psychology can distort the process. I know of a nonprofit institution whose endowment earned 16 percent a year from June 1994 to June 1999, but since its peers averaged 23 percent, the people involved with the endowment were dejected. Seth Klarman: Even the best investors judge themselves on the basis of return. It would be hard to evaluate yourself on risk, since risk cannot be measured. Apparently, the risk-averse managers of this endowment were disappointed with their relative returns even though their risk-adjusted performance was likely excellent, as borne out by their performance over the following three years. This highlights just how hard it is to maintain conviction over the long run when short-term performance is considered poor. Without growth stocks, technology stocks, buyouts and venture capital, the endowment was entirely out of step for half a decade. But then the tech stocks collapsed, and from June 2000 to June 2003 the institution earned 3 percent a year while most endowments suffered losses. The stakeholders were thrilled. There's something wrong with this picture. How can people be unhappy making 16 percent a year and happy making 3 percent? The answer lies in the tendency to compare ourselves to others and the deleterious impact this can have on what should be a constructive, analytical process. Joel Greenblatt: This is incredibly important. Most institutional and individual investors benchmark their returns, and therefore most end up chasing the crowd: accent on the wrong sylLABle. Excerpted from, The Most Important Thing Illuminated by Howard Marks. Copyright (c) 2012 Howard Marks. Used by arrangement with Columbia University Press. Howard Marks, author of The Most Important Thing Illuminated: Uncommon Sense for the Thoughtful Investor, is chairman and cofounder of Oaktree Capital Management, a Los Angeles-based investment firm with $80 billion under management. He holds a Bachelor's Degree in finance from the Wharton School and an MBA in accounting and marketing from the University of Chicago. He is the author of The Most Important Thing: Uncommon Sense for the Thoughtful Investor, published by Columbia Business School Publishing. Australia is rich in iron ore, coal and copper … and its stock of hubris seems to be growing. After a recent trip to the “quarry in China’s backyard” SocGen’s Dylan Grice is even more worried about its economy than he was beforehand. It seems a book describing Australia’s economic success as “a miracle” was the catalyst (more on that below). In a note to clients Grice is recommending shorting the aussie dollar. And, if you’re lucky enough to be Australian, stockpiling gold. But let’s rewind. His point is that the commodity boom has masked the full extent of the credit expansion and has fooled some into thinking the country’s economy is stronger than it really is. Don’t buy stocks – for real, this time. That was the message Jeffrey Gundlach delivered to investors last Tuesday. Among riskier asset classes, only equities have performed well since February 14, the date of Gundlach’s previous remarks to investors, during which he advised investors in his Doubleline funds to avoid those assets – Including equities. In his most recent conference call with investors last Tuesday, he reiterated that forecast, this time singling out equities in particular. “I really think we are not going to be making money on stocks bought at this level,” he said. Gundlach identified two “triggers” that could set off a decline in stock prices – a worsening of the fiscal crisis in Europe and the ongoing inability to confront debt problems here at home, regardless of who is elected president this fall. Bruce Greenwald likes to say that he is constituted todisagree with everybody about everything, and he was true to his word at therecent Hyman P. Minksy Conference in New York. Taking immediate exception withthe virtually unanimous characterization of the economic crisis as abalance-sheet recession, Greenwald, a professor of finance at ColumbiaUniversity, argued that, far from being unusual, balance-sheet recessions canin fact be found at the heart of almost all business cycles. The upshot of Greenwald’s talk was that, although we aretechnically out of recession, troubling structural imbalances remain andcontinue to drag down growth and employment. It really does seem to be All Spain All the Time, but there is a reason. Unlike Greece, Spain makes a difference to the eurozone. It may be both too big to allow to fail and too big to save. Last week I came across a very informative 50-page PowerPoint on the situation in Spain from Carmel Asset Management. It is too big to send, but I asked Jonathan Carmel to draft a smaller document with some of the key points. I find it compelling. You can access the entire PowerPoint on my website. If you are not registered with me, you will need to enter your email address and, if you would, your zip code or country. There is a lot if information and data in the report. It will certainly make you think. Is a new fiscal compact a possibility? One with nations giving up control of their budgets and a euro-wide bond issue by which all the nations guarantee the others' debt? Or is there some middle option? Anything is possible and everything will be discussed, as the cost of a eurozone breakup would be massive. Value investors generally characterize themselves as the grown ups in the investment world, unswayed by perceptions or momentum, and driven by fundamentals. While this may be true, at least in the abstract, there are at least three distinct strands of value investing. The first, passive value investing, is built around screening for stocks that meet specific characteristics – low multiples of earnings or book value, high returns on projects and low risk – and can be traced back to Ben Graham’s books on security analysis. The second, contrarian investing, requires investing in companies that are down on their luck and in the market. The third, activist value investing, involves taking large positions in poorly managed and low valued companies and making money from turning them around. While value investing looks impressive on paper, the performance of value investors, as a whole, is no better than that of less “sensible” investors who chose other investment philosophies and strategies. We examine explanations for why "active" value investing may not provide the promised payoffs. TED Talk - Brian Greene: Why is our universe fine-tuned for life? While the yellow metal has declined considerably in recent months, gold equities have continued to fare even worse. With today’s sell-off in precious metals, the ratio of the price of gold to the Philadelphia Gold & Silver Index (XAU) reached another new multi-year high. In late Monday morning trading, COMEX gold futures were lower by $9.80 at $1,633.00 per ounce while the XAU – a leading composite of the world’s largest precious metals companies - fell 2.5% to 160.08. At its current level of 10.2, the gold/XAU ratio reached its highest point since the depths of the 2008 financial crisis; the ratio’s all-time high occurred on October 24, 2008, at 10.72. Wall Street continues to focus on the idea that stocks are "cheap" on the basis of forward price/earnings multiples. I can't emphasize enough how badly standard P/E metrics are being distorted by record (but reliably cyclical) profit margins, which remain about 50-70% above historical norms. Our attention to profit margins and the use of normalized valuation measures is nothing new, nor is our view that record profit margins have corrupted many widely-followed valuation measures. As I noted in our September 8, 2008 comment Deja Vu (Again), which happened to be a week before Lehman failed and the market collapsed, "Currently, the S&P 500 is trading at about 15 times prior peak earnings, but that multiple is somewhat misleading because those prior peak earnings reflected extremely elevated profit margins on a historical basis. On normalized profit margins, the market's current valuation remains well above the level established at any prior bear market low, including 2002 (in fact, it is closer to levels established at most historical bull market peaks). Based on our standard methodology, the S&P 500 Index is priced to achieve expected total returns over the coming decade in the range of 4-6% annually." Present valuations are of course more elevated today than they were before that plunge. Suffice it to say that every P/E multiple is simply a shorthand for proper discounted cash-flow methods, because there are countless assumptions about growth, margins, return on invested capital and other factors quietly baked inside. Like price-to-forward operating earnings multiples, even our old price-to-peak earnings metric has been rendered misleading due to historically high profit margins. Of course, we knew that was happening even before the credit crisis began, and believe that numerous widely-followed valuation measures remain distorted by record profit margins here. Kindle Direct Publishing has quickly taken on astonishing scale – more than a thousand KDP authors now each sell more than a thousand copies a month, some have already reached hundreds of thousands of sales, and two have already joined the Kindle Million Club. KDP is a big win for authors. Authors who use KDP get to keep their copyrights, keep their derivative rights, get to publish on their schedule – a typical delay in traditional publishing can be a year or more from the time the book is finished – and … saving the best for last … KDP authors can get paid royalties of 70%. The largest traditional publishers pay royalties of only 17.5% on ebooks (they pay 25% of 70% of the selling price which works out to be 17.5% of the selling price). The KDP royalty structure is completely transformative for authors. A typical selling price for a KDP book is a reader-friendly $2.99 – authors get approximately $2 of that! With the legacy royalty of 17.5%, the selling price would have to be $11.43 to yield the same $2 per unit royalty. I assure you that authors sell many, many more copies at $2.99 than they would at $11.43. Kindle Direct Publishing is good for readers because they get lower prices, but perhaps just as important, readers also get access to more diversity since authors that might have been rejected by establishment publishing channels now get their chance in the marketplace. You can get a pretty good window into this. Take a look at the Kindle best-seller list, and compare it to the New York Times best-seller list – which is more diverse? The Kindle list is chock-full of books from small presses and self-published authors, while the New York Times list is dominated by successful and established authors. Amazonians are leaning into the future, with radical and transformational innovations that create value for thousands of authors, entrepreneurs, and developers. Invention has become second nature at Amazon, and in my view the team’s pace of innovation is even accelerating – I can assure you it’s very energizing. I’m extremely proud of the whole team, and feel lucky to have a front row seat. The source is not runaway entrepreneurial capitalism, which rewards those who best serve the consumer in product and price. (Would we really want it any other way?) There is another force that has turned a natural divide into a chasm: the Federal Reserve. The relentless expansion of credit by the Fed creates artificial disparities based on political privilege and economic power. David Hume, the 18th-century Scottish philosopher, pointed out that when money is inserted into the economy (from a government printing press or, as in Hume's time, the importation of gold and silver), it is not distributed evenly but "confined to the coffers of a few persons, who immediately seek to employ it to advantage." Searching for higher returns to bridge looming shortfalls,public workers’ pension funds across the country are increasingly turning toriskier investments in private equity, real estate and hedge funds. But while their fees have soared, their returns have not. Infact, a number of retirement systems that have stuck with more traditionalinvestments in stocks and bonds have performed better in recent years, for afraction of the fees. Consider the contrast between the state retirement fund forPennsylvania and the one for Georgia. The $26.3 billion Pennsylvania State Employees’ RetirementSystem has more than 46 percent of its assets in riskier alternatives,including nearly 400 private equity, venture capital and real estate funds. The system paid about $1.35 billion in management fees inthe last five years and reported a five-year annualized return of 3.6 percent.That is below the 8 percent target needed to meet its financing requirements,and it also lags behind a 4.9 percent median return among public pensionsystems. In Georgia, the $14.4 billion municipal retirement system,which is prohibited by state law from investing in alternative investments, hasearned 5.3 percent annually over the same time frame and paid about $54 milliontotal in fees. Broadcast (2007) With their intelligent gaze, human-like posture, and peaceful nature, it's no wonder bonobos—one of five great apes, along with gorillas, chimpanzees, orangutans, and humans—remind us of ourselves. But while we share a common hominoid ancestor with bonobos as well as 98 percent of our DNA, this unique primate has been largely overlooked by all but a few scientists. I posted this before, but since it is so good and I saw Tim Ferriss put up a post on it, I thought I'd post it again. As your investment manager our goal is to own shares in outstanding public companies that boast both excellent long-term performance records and ethical corporate governance standards. In the normal course of business we shouldn’t need to vote against management’s recommendations on proxy issues, because we trust management to act in our best interest. Unfortunately, this year we are voting against James A. Johnson as he stands for re-election to the board of directors of Goldman Sachs, which we own for Sequoia Fund and separately-managed accounts. Mr. Johnson also serves on the board of Target Corp., which we own, and which should issue its proxy soon. If Mr. Johnson stands for re-election at Target, we intend to vote against him. If you vote your own shares in accounts we manage for you, we recommend you vote against James Johnson. “The most common cause of low prices is pessimism - some times pervasive, some times specific to a company or industry. We want to do business in such an environment, not because we like pessimism but because we like the prices it produces. It's optimism that is the enemy of the rational buyer. The central truth of the investment business is that investment behavior is driven by career risk. In the professional investment business we are all agents, managing other peoples’ money. The prime directive, as Keynes knew so well, is first and last to keep your job. To do this, he explained that you must never, ever be wrong on your own. To prevent this calamity, professional investors pay ruthless attention to what other investors in general are doing. The great majority “go with the flow,” either completely or partially. This creates herding, or momentum, which drives prices far above or far below fair price. There are many other inefficiencies in market pricing, but this is by far the largest. It explains the discrepancy between a remarkably volatile stock market and a remarkably stable GDP growth, together with an equally stable growth in “fair value” for the stock market. This difference is massive – two-thirds of the time annual GDP growth and annual change in the fair value of the market is within plus or minus a tiny 1% of its long-term trend as shown in Exhibit 1. The market’s actual price – brought to us by the workings of wild and wooly individuals – is within plus or minus 19% two-thirds of the time. Thus, the market moves 19 times more than is justified by the underlying engines! This exemplifies perfectly Warren Buffett’s adage that investing is simple but not easy. It is simple to see what is necessary, but not easy to be willing or able to do it. To repeat an old story: in 1998 and 1999 I got about 1100 fulltime equity professionals to vote on two questions. Each and every one agreed that if the P/E on the S&P were to go back to 17 times earnings from its level then of 28 to 35 times, it would guarantee a major bear market. Much more remarkably, only 7 voted that it would not go back! Thus, more than 99% of the analysts and portfolio managers of the great, and the not so great, investment houses believed that there would indeed be “a major bear market” even as their spokespeople, with a handful of honorable exceptions, reassured clients that there was no need to worry. Career and business risk is not at all evenly spread across all investment levels. Career risk is very modest, for example, when you are picking insurance stocks; it is therefore hard to lose your job. It will usually take 4 or 5 years before it becomes reasonably clear that your selections are far from stellar and by then, with any luck, the research director will have changed once or twice and your deficiencies will have been lost in history. Picking oil, say, versus insurance is much more visible and therefore more dangerous. Picking cash or “conservatism” against a roaring bull market probably lies beyond the pain threshold of any publicly traded enterprise. It simply cannot take the risk of being seen to be “wrong” about the big picture for 2 or 3 years, along with the associated loss of business. Remember, expensive markets can continue on to become obscenely expensive 2 or 3 years later, as Japan and the tech bubble proved. Thus, because asset class selection packs a more deadly punch in the career and business risk game, the great investment opportunities are much more likely to be at the asset class level than at the stock or industry level. But even if you know this, dear professional reader, you will probably not be able to do too much about it if you value your job as did the nearly 1100 analysts in my survey. Except, perhaps, with your own assets or, say, your sister’s pension assets. A treasure trove of unearthed interviews, conducted by the writer who knew him best, reveals how Jobs's ultimate success at Apple can be traced directly to his so-called wilderness years. Aubrey K. McClendon is one of the most successful energy entrepreneurs of recent decades. But he hasn’t always proved popular with shareholders of the company he co-founded, Chesapeake Energy Corp., the second-largest natural gas producer in the United States. McClendon, 52, helped cause Chesapeake shares to plummet amid the financial crisis when he sold hundreds of millions of dollars in stock to raise cash for himself. Later, to settle a lawsuit by shareholders, he agreed to buy back a $12 million map collection that he’d sold to Chesapeake. His approach to running his company also is renowned: Among other employee perks, on-site Botox treatments are available at its headquarters in Oklahoma City, Oklahoma. Now, a series of previously undisclosed loans to McClendon could once again put Chesapeake’s CEO and shareholders at odds. McClendon has borrowed as much as $1.1 billion in the last three years by pledging his stake in the company’s oil and natural gas wells as collateral, documents reviewed by Reuters show. Among the members of the rogues' gallery blamed for the crash of the economy in 2008, none have worn the black hat of villainy quite as convincingly as greedy financiers. Robert J. Shiller, however, sees them and their field in shades of gray. "It's kind of a mythology that's developed around finance," says Mr. Shiller, a behavioral economist, professor at Yale University, and teacher of many future financiers. Rapacious Wall Street types, he says, may make handy bad guys in the movies. "The problem is, we can't live in a mythic world. We have to live in the real world." And in the real world, Mr. Shiller argues in his new book, Finance and the Good Society (Princeton University Press), finance is a powerful and necessary tool to keep society running. It is the architecture that allows people to reach their goals, such as paying for college or starting a business, and to protect their assets throughout their lives. This is a great example of Peter Bevelin pulling complementary quotes together from different Warren Buffett letters to shareholders in his new book, A Few Lessons for Investors and Managers. The book also includes thoughts from Peter that add to the discussion. Related article (Carol Loomis): How Berkshire Hathaway CEO Warren Buffett spent the week he found out he has prostate cancer: Business as usual. When a group of millionaires appear onstage with a Democratic President to call for higher taxes on people like them, you know one of two things: either the President is in Hollywood, or something interesting is happening in the country at large. In this case, it’s the latter. After three decades in which rising inequality was largely ignored, it has finally emerged as a serious political issue—or, at least, President Obama is trying to turn it into one. I’ll have more to say later about the “Buffett Rule” that Obama has proposed, which would force people who make upwards of a million dollars a year to pay at least thirty per cent of their income to the federal government. But before getting into a policy discussion, I thought it might be useful to provide a reminder, with the aid of some charts, about the basic facts underlying the debate. The standard of living of the average American continues to fall. Real median household income today is near the same level as it was fifteen years ago, a remarkable statistic since the debt to GDP ratio is 100 points higher (Chart 1). The cause of this deterioration in living standards can be traced to the excessive accumulation of debt, as well as the debt proportion that has turned increasingly unproductive, or even counterproductive. When debt is utilized to finance nonproductive assets, an economic process is initiated that undermines prosperity. Productivity gains must be generated in order to boost income, and thereby the standard of living. If debt enhances productivity, incomes will expand and the economic pie will be enlarged. Otherwise, the debt increase exercise is debilitating to economic growth. It has surprised me that discussion of the JOBS Act has not perpetuated the "investing blog" universe given the ramification of this new legislation. I am hoping this post will be a springboard for institutional investors and writers to begin discussion of the bill and its implications for those in the professional money management business. I'd encourage you to forward this post to those who may be interested. Mentioned by both Steve Keen and Yves Smith. TED Talk - Atul Gawande: How do we heal medicine? The myth of the "creative type" is just that--a myth, argues Jonah Lehrer. In an interview with WSJ's Gary Rosen he explains the evidence suggesting everyone has the potential to be the next Milton Glaser or Yo-Yo Ma.